The next stages of the project will commence in line with budget availability and the results of a Council parking survey. Works on foundation repairs, fixing cracks in the walls and drainage improvements at the old school hall were completed on time in mid May 2017- with additional internal painting also being carried out. The scope of work for the hall repairs included foundation repairs and fixing of the cracks in the walls along with guttering and drainage improvements. It also included installation of a ramp compliant with relevant Australian disability standards and replacement of hard concrete paving with permeable paths like those on the western side of the building. When some of the furniture items were removed it was found that a small section of the floor had collapsed. That has now been repaired. Some rooms badly needed repainting. The MPS Maintenance group took the opportunity to paint the hall internals while the furniture was out of the building. Since then, heating and an overhead fan has been installed. These have been tested extensively over winter, 2018 and were found to be highly successful! 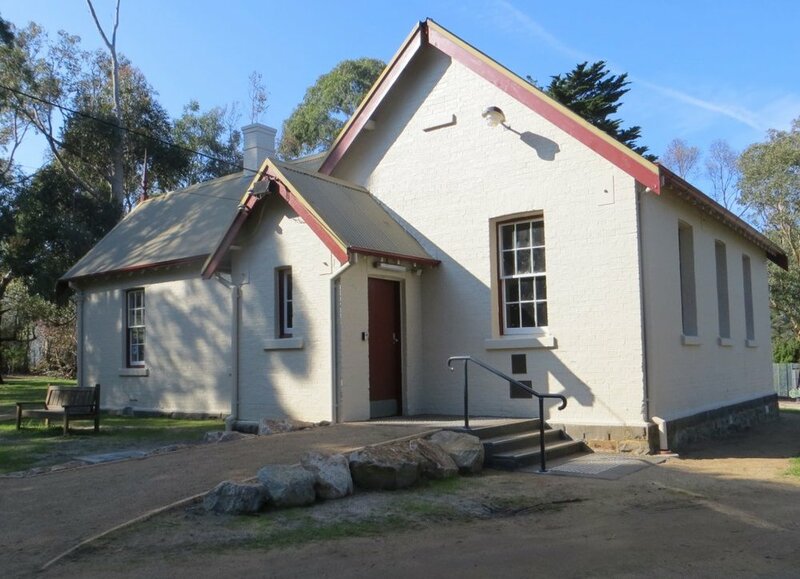 For hall bookings, please phone the Shire on 5950 1150. In November 2016, the Green Army came to the Shoreham Triangle to help build a walking path to encourage visitors to view what has happened since replanting took place in 2010. In 2009, this area at the rear of the CFA station was cleared of 1-200 pine trees to minimise fire risk. A community consultation process was undertaken to gauge what local people wanted to see in "The Triangle" as it came to be known. It was decided to replant with fire resistant or retardant locally indigenous species as far as possible. The replanting of appropriate shrubs, trees and grasses was undertaken by community volunteers. The initial clearing, mulching and supply of plants was undertaken by the Shire. Additional plantings and maintenance by community volunteers with Shire support has been ongoing. This has been a joint project between the Shoreham Community Association, Shoreham CFA and Mornington Peninsula Shire. We thank all the community members who have contributed to this project over the past 8 years and the Shire for its continued commitment. Since then, in 2017 and 2018, there have been regular working bees to maintain the area. In addition, an Easter Egg Hunt has been held both years in The Triangle to show off the area to the community in a fun way. We encourage everyone to come for a stroll through the area to see the progress made with Shire assistance. Please be aware that we need to park outside the Shoreham CFA area - so please park in Byrnes Road and walk in. This Project has focussed on work with Mornington Peninsula Shire and VicRoads to improve, in particular, the north and south entrances to Shoreham at the Byrnes Road / Frankston-Flinders Road intersections. As many know, the SCA Committee has wished to improve the sight and condition of the verges for a number of years. There has been some significant weed control at the northern intersection thanks to spraying by the Shire and Rod McKillop has contributed an amazing effort on the southern entrance alongside Stony Creek where he has carefully manicured an area between the Frankston-Flinders and Byrnes Roads. As you enter Byrnes Road at the northern end from Frankston-Flinders Road, we hope you are pleasantly surprised to see the view across the landscape towards Flinders. Mornington Peninsula Council’s Natural Systems Unit carried out the work removing woody weeds including small radiata pines and the dead lower branches of larger trees. SCA has been in regular contact with Council regarding assistance in weed removal. It was fortunate after consultation with Council representatives that money from the Fire Protection Program was made available for this project. We are also pleased that weed removal will continue along Byrnes Road down to the CFA entrance.The next stage will be to monitor any weeds that find their way into the sunlight and eventually to plant low understorey indigenous species as cover. For information contact: Sue Boggan on 0404 180 957. Council Contractors carried out a program of tree pruning Shoreham roads last year. This program is to occur every five years. Community concerns as to how some trees were treated have been discussed with relevant Council representatives. Safety factors (eg road safety and emergency vehicle access) drive decisions to prune or remove tree limbs. As we wish to retain the canopy along Shoreham roadsides, our communication with Council is important in how we work together to achieve this in future. Kareela Native Nursery, next to the Bittern Garage, which has local indigenous plants and helpful staff. Open Thursday, Friday and Saturday mornings. The Council Nursery at the Briars. Your help and contributions to the Shoreham environment is appreciated. For any information regarding weeds and vegetation and if you are interested in assisting in roadside projects please contact: Sue Boggan 0404 180 957. Howard Street connects “old” and “new” Shoreham. Residents who enjoy walking through Shoreham along Howard Street will be well aware of the blackberries and other weeds that abound there. Whilst we have held working bees in the past, weed removal along the track is a large undertaking. Given the track runs along a stream and the land is the Council’s responsibility, SCA representatives arranged to meet with Council officers on-site. We are pleased to inform you that the track qualifies for a ‘Corridors of Green Grant.’ The Natural Systems Team of MPSC will be following up the process to obtain a grant to remove the weeds. This will enable plant regeneration and improved habitat for birds and fauna that hide within the area as well as making it a more enjoyable place to walk. For information contact: Sue Boggan on 0404 180 957. Stage 1 (Civil Engineering Study) of this project is complete. This project aims to provide trails to be shared by walkers and cyclists between the local communities of Shoreham, Point Leo and Red Hill. Shared trails have been widely developed on the Port Phillip side of the Peninsula and the Northern Westernport area. This project seeks to ensure that Southern Westernport communities get to enjoy the same level of amenity as their Port Phillip Bay Peninsula neighbours. 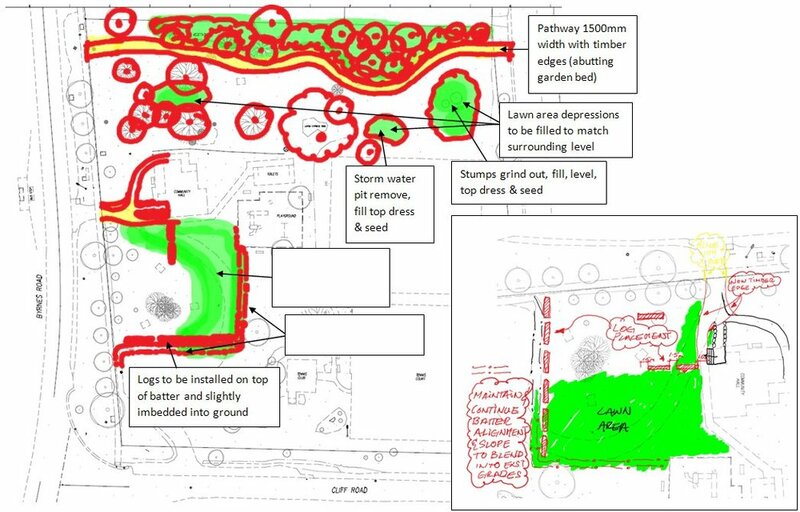 In July 2015, the Mornington Peninsula Shire provided a Placemaking Grant of $3020 to the Shoreham Community Association, together with the Point Leo Foreshore Park and Reserve Committee of Management, to facilitate a scoping study for the proposed shared trail that would link Shoreham and Point Leo. A civil engineer was engaged for and conducted two inspections in the area prior to undertaking a survey. The area is badly weed infested and, in most places, impenetrable - but does contain some important stands of banksias as well as other significant indigenous species. Under the Australian Walking Track Grading System, walking trails are graded on a difficulty scale from grades one to five. The engineer has advised that the proposed trail would fall within Grade 3 ie one that is recommended for people with some bushwalking experience. It is not, unfortunately, a trail that would be wheelchair friendly. It is proposed that the trail be comprised of a narrow mown grass track that follows the natural contours of the topography in order to minimise disturbance. There would be no steps, something that would facilitate use by prams, bikes and the differing fitness levels of users. The trail would be some way from the beach and dunes, the intervening distance providing a natural barrier to prevent possible erosion should users move away from the designated track. In the unlikely event this does occur, fencing may be needed. As far as possible, the trail would be planned to engage with significant stands of Banksias and other native bush to provide interest for users. The aim would be to complete the project at minimal cost - construction being carried out primarily by employees of Point Leo Foreshore Reserve. Public consultation would occur once a more concrete idea of the trail's route is known. If both communities support the project, complex permit applications would be undertaken with the Shire and other relevant authorities. The time frame for implementing this jointly coordinated project would be several years.